This one-day training introduced relevant best practices for entrepreneurs and MSMEs through presentations by Canadian and Indonesian trainers on business development with a focus on building human capital. The training session included a module that launched the Indonesia online toolkit and trained MSMEs on its use. This one-day training introduced relevant best practices for entrepreneurs and MSMEs through presentations by Canadian and Filippino trainers on business development with a focus on market access. The training session included a module that launched the Philippines online toolkit and trained MSMEs on its use. 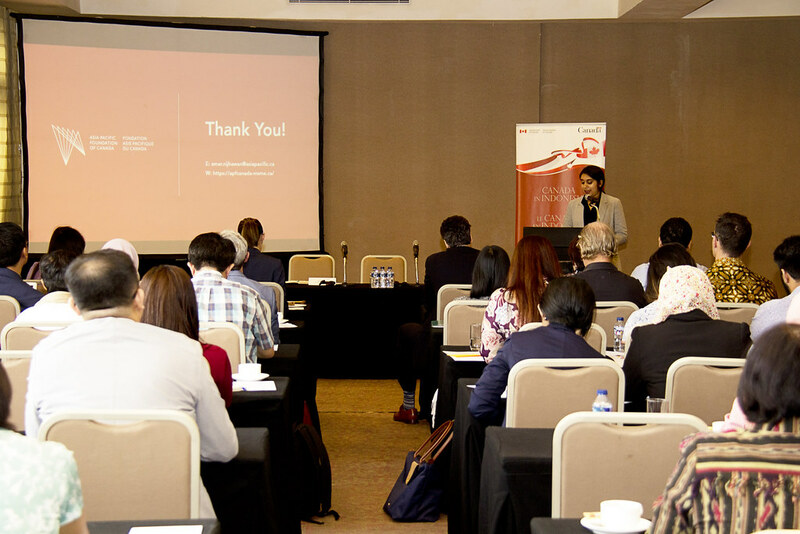 This one-day research and policy workshop brought together Canadian and Indonesian researchers, policy-makers, and local entrepreneurs to discuss APF Canada research on MSMEs and human capital issues. The workshop had a session to discuss the results of the 2018 Survey of MSMEs and Entrepreneurs in Indonesia: Building the Capacity of MSMEs Through Human Capital. This one-day research and policy workshop brought together Canadian and Filipino researchers, policy-makers, and local entrepreneurs to discuss APF Canada research on MSMEs and market access issues. The workshop had a session to discuss the results of the 2018 Survey of MSMEs and Entrepreneurs in Philippines: Building the Capacity of MSMEs Through Market Access. This one-day training on the margins of the APEC Summit 2017, introduced relevant best practices for entrepreneurs and MSMEs through presentations by Canadian and Vietnamese trainers on business development with a focus on technology and innovation. The training session included a module that launched the Vietnam online toolkit and trained MSMEs on its use. This one-day research and policy workshop on the margins of the APEC Ministerial Meetings, brought together Canadian and Vietnamese researchers, policy-makers, and local entrepreneurs to discuss APF Canada research on technology and innovation. The workshop had a session to discuss the results of the 2017 Survey of MSMEs and Entrepreneurs in Vietnam: Building the Capacity of MSMEs Through Technology and Innovation. This one-day symposium was held July 25, 2017 in the margins of the APEC Business Advisory Council (ABAC) III meeting, which was held July 26-28 in Toronto. ABAC is the private sector arm of the Asia Pacific Economic Cooperation (APEC) and comprises a wide array of business leaders from the 21 APEC economies.